Mix and match any three of our Gourmet Mackinac Island Fudge Flavors in this three slice gift box. Each slice is approx. 1/2 lb. All of our fudge is made with only the finest ingredients and worked on a marble slab the old fashioned way. 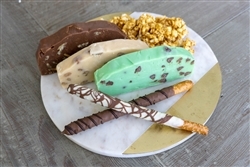 Mix and match any three of our Gourmet Mackinac Island Fudge Flavors in this three slice gift box. Each slice is approx. 1/2 lb. This is the best fudge ever! I'm going to order every week!! !